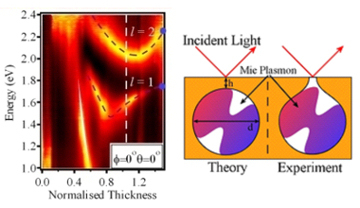 In the introduction to plasmons, on the previous page, a plot was shown of how the localised plasmon energy depended on the normalised thickness of the nano-structured surface, and it was shown that as the voids gets deeper the energy of the localised plasmons decreased. This can be understood by considering a standing wave following the curvature of the dish, and saying that as the void gets deeper the wavelength increases and hence the energy reduces, see the image to the right. However, there is an interesting aspect of the data that cannot be easily understood through this rule. When the thickness gets close to a value of 1 (an encapsulated void) the energy of these modes starts to increase. This happens to both modes in the figure in a very controlled way. To understand this effect requires a better understanding of the actual surface geometry as well as some more in-depth theory. In the growth process it is hard to close the cavity at the top, so instead of a nice spherical cavity there is a cone extending from the cavity to the top surface. This means about a value we have defined at an encapsulated void there is still some possibility of the localised mode to communicate with the top surface, see the right side of the figure. Under these conditions the theorists on the project had already speculated that there should be a mode that increases in energy as the thickness of the top surface increases. 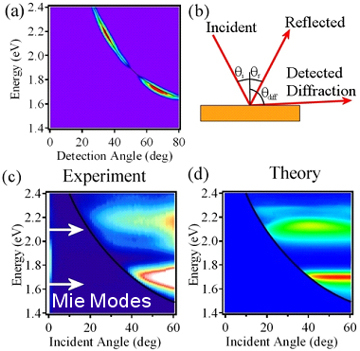 This is easier to understand from the other perspective: When there is a pick piece of gold sitting above the cavity the localised plasmon mode is identical to that calculated, however, since there is a lot of metal between the cavity and surface the coupling is weak and so the mode is less easily seen. As the thickness decreases there is more coupling which increases the absorption, but also increases the volume of the mode (it exists more strongly within the metal and air region at the top of the void). This increase in volume acts to drop the energy of the plasmon mode as seen, until the geometry starts to change and then there this effect acts to again start to increase the mode energy as the actual mode properties are altered. Now we have a full understanding of the separate plamons interactions we can progress to consider further plasmon interactions. Since plasmons interact strongly with optical fields it might be expected that they alter the way in which the surfaces diffract light. To test this we ran a similar procedure to before, however now things are controlled a little differently. A surface diffracts light of different colours into different angles. This is shown in the first plot where the colour scale runs from purple through to red. Here the incident white light is brought onto the sample at one angle, and then the detector is moved to collect all of the different diffracted angles, shown as the coloured band. This is very straight forward to understand theoretically, however the variation in intensity is less easy to understand. To build up a better picture the above experiment is repeated for every different incident angle to build up a large number of images. From each image the intensity along the line of diffraction is extracted (the thin black line in the top image). Each of these is then added to the bottom image to show the full structure of the diffracted light. This is compared to the data calculated by the theorists, again an excellent correlation is observed. As can be seen the diffracted light is enhanced at the energies of the Mie plasmons. The reason for this is that light from the incident beam is converted to plamons which can then be reconverted to an optical beam. Since plasmons require the extra momentum from the grating to interact with the optical field they couple well to the diffracted orders, and so act to convert light from the reflected beam into the diffracted one, leading to a rise in the observed signal. The previous page has discussed the basics of plasmons and has introduced the two different types - localised and surface. Surface plasmons mostly occur on surfaces with small perturbations, localised plasmons by contract exist within the voids in the surfaces we are studying (see the introduction to nano-structrues section). 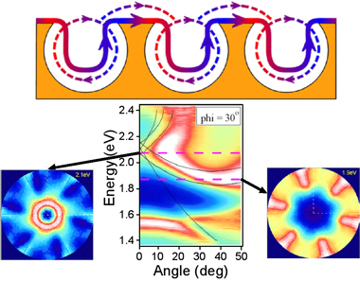 Now we consider what happens when we make a surface that supports both types of plasmon. The figure shows data from just such a region. Now we no longer see the straight forward behaviour of the previous example. The features are much more complicated and in some places have 6-fold symmetry (indicating that the plasmons are free to flow over the surface) and in others are circularly symmetric (indicating that the plasmons are localised in the voids). In the lower part of the image we can also see that a feature that starts out localised (same energy for different angles) smoothly converts to a delocalised surface feature (changes energy with angle). This effect is known as mixing and happens when there are strong interactions between different phenomena, in this case the plasmons. We can now consider the plasmons to be partly flowing over the surface and partly trapped. This can either be viewed as trapped plasmons that can sometimes jump between voids or surface plasmons that sometimes become trapped in the voids. As we follow the lower mode from left to right it starts out as a surface plasmon, then gradually converts to a localised one, passing through all the above mentioned states. Excitons are another form of quasi-particle. Whereas plasmons polaritons are combinations of light and communal oscillations of electrons, an excitons is an electron rotating around a hole (a hole is actually the lack of an electron but in cases such as this the hole appears as a real particle that acts like an electron with a positive charge, often life throws up crazy, complex things like this, which is why physics is interesting, if rather confusing). 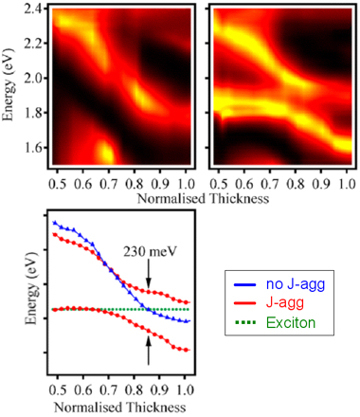 In this example we use a special dye which has a strong exciton feature, so we have many of these electron-hole pairs floating about over the metals surface. Excitons absorb light strongly at a single frequency (energy), as indicated by the green dashed line in the lower plot. The upper plot shows a thickness scan of a sample, and a single strong localised plasmon can be seen, dropping in energy with increasing thickness, this is plotted in blue on the lower graph. Now we bring the exciton onto the sample so it can interact with the localised plasmon and repeat the scan. Now we see what is again referred to as anti-crossing - instead of the plasmon and exciton absorption features acting independently and crossing each other, they repel one another and we get the situation where a feature starts out being a plasmon gradually converts into being an exciton. Again this throws up many interesting questions as to what is really happening now we have an entity that is made up of light, communal oscillations of electrons and coupled pairs of electrons and hole. This new entity is thus rather complex and can have a variety of properties. As an example we find that fluorescence from the sample is now enhanced as the plasmons help the dye to emit more light. This could be of use for creating more efficient light emitters, although the potential of such a system has great interest in its own right due to its complexity. This section has provided an introduction into the startling complexity of physics that occurs when light is shone onto a nano-structured gold surface. Most of the above examples are interesting, but do not lend themselves easily to useful applications, however there is one division of plasmonics that is already in active use, and that is Surface Enhanced Raman, discussed on the following page. Y. Sugawara, T.A. Kelf, J.J. Baumberg, M.E. Abdelsalam and P.N. Bartlett. T.V. Teperik, V.V. Popov, F.J. Garcia de Abajo, T.A. Kelf, Y. Sugawara, J.J. Baumberg, M.E. Abdelsalam, P.N. Bartlett. T.V. Teperik, V.V. Popov, F.J. Garcia de Abajo, M.E. Abdelsalam, P.N. Bartlett, T.A. Kelf, Y. Sugawara, J.J. Baumberg. T.A. Kelf, Y. Sugawara, J.J. Baumberg, M.E. Abdelsalam, P.N. Bartlett.